ASL signs have a number of phonemic components, including movement of the face and torso as well as the hands. ASL is not a form of pantomime, but iconicity does play a larger role in ASL than in spoken languages. English loan words are often borrowed through fingerspelling, although ASL grammar is unrelated to that of English. ASL has verbal agreement and aspectual marking and has a productive system of forming agglutinative classifiers. Many linguists believe ASL to be a subject-verb-object (SVO) language, but there are several alternative proposals to account for ASL word order. ASL emerged as a language in the American School for the Deaf (ASD), founded in 1817. This school brought together Old French Sign Language, various village sign languages, and home sign systems; ASL was created in this situation of language contact. ASL was influenced by its forerunners but distinct from all of them. It has been proposed that ASL is a creole with LSF as the superstrate language and with the native village sign languages as substrate languages. However, more recent research has shown that modern ASL does not share many of the structural features that characterize creole languages. ASL may have begun as a creole and then undergone structural change over time, but it is also possible that it was never a creole-type language. There are modality-specific reasons that sign languages tend towards agglutination, for example the ability to simultaneously convey information via the face, head, torso, and other body parts. This might override creole characteristics such as the tendency towards isolating morphology. Additionally, Clerc and Gallaudet may have used an artificially constructed form of manually coded language in instruction rather than true LSF. Although the United States, the United Kingdom, and Australia share English as a common oral and written language, ASL is not mutually intelligible with British Sign Language (BSL) or Auslan. All three languages show degrees of borrowing from English, but this alone is not sufficient for cross-language comprehension. It has been found that a relatively high percentage (37-44%) of ASL signs have similar translations in Auslan, which for oral languages would suggest that they belong to the same language family. However, this does not seem justified historically for ASL and Auslan, and it is likely that this resemblance is due to the higher degree of iconicity in sign languages in general, as well as contact with English. 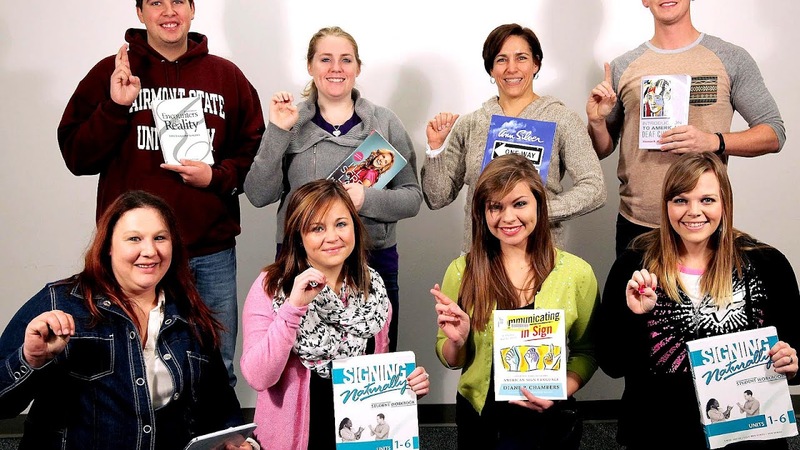 American Sign Language is growing in popularity among many states. Many people in high school and colleges wanting to take it as a foreign language, but until recently, it was not a creditable foreign language elective. The issue was that many didn't consider it a foreign language. ASL users, however, have a very distinct culture and way they interact when talking. Their facial expressions and hand movements reflect what they are conveying. They also have their own sentence structure which sets the language apart. Prior to the birth of ASL, sign language had been used by various communities in the United States. In the United States, as elsewhere in the world, hearing families with deaf children have historically employed ad-hoc home sign, which often reaches much higher levels of sophistication than gestures used by hearing people in spoken conversation. As early as 1541 at first contact by Francisco Vásquez de Coronado, there were reports that the Plains Indians had developed a sign language to communicate between tribes of different languages. In the 19th century, a "triangle" of village sign languages developed in New England: one in Martha's Vineyard, Massachusetts; one in Henniker, New Hampshire, and one in Sandy River Valley, Maine. Martha's Vineyard Sign Language (MVSL), which was particularly important for the history of ASL, was used mainly in Chilmark, Massachusetts. Due to intermarriage in the original community of English settlers of the 1690s, and the recessive nature of genetic deafness, Chilmark had a high 4% rate of genetic deafness. MVSL was used even by hearing residents whenever a deaf person was present. ASL is thought to have originated in the American School for the Deaf (ASD), founded in Hartford, Connecticut in 1817. Originally known as The American Asylum, At Hartford, For The Education And Instruction Of The Deaf And Dumb, the school was founded by the Yale graduate and divinity student Thomas Hopkins Gallaudet. Gallaudet, inspired by his success in demonstrating the learning abilities of a young deaf girl Alice Cogswell, traveled to Europe in order to learn deaf pedagogy from European institutions. Ultimately, Gallaudet chose to adopt the methods of the French Institut National de Jeunes Sourds de Paris, and convinced Laurent Clerc, an assistant to the school's founder Charles-Michel de l'Épée, to accompany him back to the United States. Upon his return, Gallaudet founded the ASD on April 15, 1817. The largest group of students during the first seven decades of the school were from Martha's Vineyard, and they brought MVSL with them. There were also 44 students from around Henniker, New Hampshire, and 27 from the Sandy River valley in Maine, each of which had their own village sign language. Other students brought knowledge of their own home signs. Laurent Clerc, the first teacher at ASD, taught using French Sign Language (LSF), which itself had developed in the Parisian school for the deaf established in 1755. From this situation of language contact, a new language emerged, now known as ASL. More schools for the deaf were founded after ASD, and knowledge of ASL spread to these schools. In addition, the rise of Deaf community organizations bolstered the continued use of ASL. Societies such as the National Association of the Deaf and the National Fraternal Society of the Deaf held national conventions that attracted signers from across the country. This all contributed to ASL's wide use over a large geographical area, atypical of a sign language. Up to the 1950s, the predominant method in deaf education was oralism - acquiring oral language comprehension and production. Linguists did not consider sign language to be true "language", but rather something inferior. Recognition of the legitimacy of ASL was achieved by William Stokoe, a linguist who arrived at Gallaudet University in 1955 when this was still the dominant assumption. Aided by the civil rights movement of the 1960s, Stokoe argued for manualism, the use of sign language in deaf education. Stokoe noted that sign language shares the important features that oral languages have as a means of communication, and even devised a transcription system for ASL. In doing so, Stokoe revolutionized both deaf education and linguistics. In the 1960s, ASL was sometimes referred to as "Ameslan", but this term is now considered obsolete. Counting the number of ASL signers is difficult because ASL users have never been counted by the American census. The ultimate source for current estimates of the number of ASL users in the United States is a report for the National Census of the Deaf Population (NCDP) by Schein and Delk (1974). Based on a 1972 survey of the NCDP, Schein and Delk provided estimates consistent with a signing population between 250,000 and 500,000. The survey did not distinguish between ASL and other forms of signing; in fact, the name "ASL" was not yet in widespread use. Incorrect figures are sometimes cited for the population of ASL speakers in the United States based on misunderstandings of known statistics. Demographics of the deaf population have been confused with those of ASL use, since adults who become deaf late in life rarely use ASL in the home. This accounts for currently cited estimations which are greater than 500,000; such mistaken estimations can reach as high as 15,000,000. A 100,000-person lower bound has been cited for ASL users; the source of this figure is unclear, but it may be an estimate of prelingual deafness, which is correlated with but not equivalent to signing. ASL is sometimes incorrectly cited as the third- or fourth-most-spoken language in the United States. These figures misquote Schein and Delk (1974), who actually concluded that ASL speakers constituted the third-largest population requiring an interpreter in court. Although this would make ASL the third-most used language among monolinguals other than English, it does not imply that it is the fourth-most-spoken language in the United States, since speakers of other languages may also speak English. ASL is used throughout Anglo-America. This contrasts with Europe, where a variety of sign languages are used within the same continent. The unique situation of ASL seems to have been caused by the proliferation of ASL through schools influenced by the American School for the Deaf, wherein ASL originated, and the rise of community organizations for the Deaf. Throughout West Africa, ASL-based sign languages are spoken by educated Deaf adults. These languages, imported by boarding schools, are often considered by associations to be the official sign languages of their countries, and are named accordingly, e.g. Nigerian Sign Language, Ghanaian Sign Language. Such signing systems are found in Benin, Burkina Faso, Ivory Coast, Ghana, Liberia, Mauritania, Mali, Nigeria, and Togo. Due to lack of data, it is still an open question how similar these sign languages are to the variety of ASL used in America. Just as there are accents in speech, there are regional accents in sign. People from the South sign slower than people in the North--even people from northern and southern Indiana have different styles. There is also a distinct variety of ASL used by the Black Deaf community. Black ASL evolved as a result of racially segregated schools in some states, which included the residential schools for the deaf. Black ASL differs from standard ASL in vocabulary, phonology, and some grammatical structure. While African American Vernacular English (AAVE) is generally viewed as more innovating than standard English, Black ASL is more conservative than standard ASL, preserving older forms of many signs. Black sign language speakers use more two-handed signs than in mainstream ASL, are less likely to show assimilatory lowering of signs produced on the forehead (e.g. KNOW) and use a wider signing space. Modern Black ASL borrows a number of idioms from AAVE; for instance, the AAVE idiom "I feel you" is calqued into Black ASL. ASL is used internationally as a lingua franca, and a number of closely related sign languages derived from ASL are used in many different countries. Even so, there have been varying degrees of divergence from standard ASL in these imported ASL varieties. Bolivian Sign Language is reported to be a dialect of ASL, no more divergent than other acknowledged dialects. On the other hand, it is also known that some imported ASL varieties have diverged to the extent of being separate languages. For example, Malaysian Sign Language, which has ASL origins, is no longer mutually comprehensible with ASL and must be considered its own language. For some imported ASL varieties, such as those used in West Africa, it is still an open question how similar they are to American ASL. The majority of children born to deaf parents are hearing. These children, known as CODAs ("Children Of Deaf Adults") are often more culturally Deaf than deaf children, the majority of whom are born to hearing parents. Unlike many deaf children, CODAs acquire ASL as well as Deaf cultural values and behaviors from birth. These bilingual hearing children may be mistakenly labeled as being "slow learners" or as having "language difficulties" due to preferential attitudes towards spoken language. Although there is no well-established writing system for ASL, written sign language dates back almost two centuries. The first systematic writing system for a sign language seems to be that of Roch-Ambroise Auguste Bébian, developed in 1825. However, written sign language remained marginal among the public. In the 1960s, linguist William Stokoe created Stokoe notation specifically for ASL. It is alphabetic, with a letter or diacritic for every phonemic (distinctive) hand shape, orientation, motion, and position, though it lacks any representation of facial expression, and is better suited for individual words than for extended passages of text. Stokoe used this system for his 1965 A Dictionary of American Sign Language on Linguistic Principles. SignWriting, proposed in 1974 by Valerie Sutton, is the first writing system to gain use among the public and the first writing system for sign languages to be included in the Unicode Standard. SignWriting consists of more than 5000 distinct iconic graphs/glyphs. Currently, it is in use in many schools for the Deaf, particularly in Brazil, and has been used in international sign language forums with speakers and researchers in more than 40 countries, including Brazil, Ethiopia, France, Germany, Italy, Portugal, Saudi Arabia, Slovenia, Tunisia, and the United States. Sutton SignWriting has both a printed and an electronically produced form so that persons can use the system anywhere that oral languages are written (personal letters, newspapers, and media, academic research). The systematic examination of the International Sign Writing Alphabet (ISWA) as an equivalent usage structure to the International Phonetic Alphabet for spoken languages has been proposed. According to some researchers, SignWriting is not a phonemic orthography and does not have a one-to-one map from phonological forms to written forms. This assertion has been disputed and the process for each country to look at the ISWA and create a phonemic/morphemic assignment of features of each sign language was proposed by researchers Msc. Roberto Cesar Reis da Costa and Madson Barreto in a thesis forum on June 23, 2014. The SignWriting community has an open project on Wikimedia Labs to support the various Wikimedia projects on Wikimedia Incubator and elsewhere involving SignWriting. The ASL Wikipedia request was marked as eligible in 2008 and the test ASL Wikipedia has 50 articles written in ASL using SignWriting. The most widely used transcription system among academics is HamNoSys, developed at the University of Hamburg. Based on Stokoe Notation, HamNoSys was expanded to about 200 graphs in order to allow transcription of any sign language. Phonological features are usually indicated with single symbols, though the group of features that make up a handshape is indicated collectively with a symbol. There are also meaningful non-manual signals in ASL. This may include movement of the eyebrows, the cheeks, the nose, the head, the torso, and the eyes. William Stokoe proposed that these components are analogous to the phonemes of spoken languages. There has also been a proposal that these are analogous to classes like place and manner of articulation. As in spoken languages, these phonological units can be split into distinctive features. For instance, the handshapes /2/ and /3/ are distinguished by the presence or absence of the feature [± closed thumb], as illustrated to the right. ASL has processes of allophony and phonotactic restrictions. There is ongoing research into whether ASL has an analog of syllables in spoken language. ASL has a rich system of verbal inflection. This involves both grammatical aspect--how the action of verbs flows in time--and agreement marking. Aspect can be marked by changing the manner of movement of the verb; for example, continuous aspect is marked by incorporating rhythmic, circular movement, while punctual aspect is achieved by modifying the sign so that it has a stationary hand position. Verbs may agree with both the subject and the object, and are marked for number and reciprocity. Reciprocity is indicated by using two one-handed signs; for example, the sign SHOOT, made with an L-shaped handshape with inward movement of the thumb, inflects to SHOOT[reciprocal], articulated by having two L-shaped hands "shooting" at each other. ASL has a productive system of classifiers, which are used to classify objects and their movement in space. For example, a rabbit running downhill would use a classifier consisting of a bent V classifier handshape with a downhill-directed path; if the rabbit is hopping, the path is executed with a bouncy manner. In general, classifiers are composed of a "classifier handshape" bound to a "movement root". The classifier handshape represents the object as a whole, incorporating such attributes as surface, depth, and shape, and is usually very iconic. The movement root consists of a path, a direction and a manner. Topicalization, accompanied with a null subject and a subject copy, can produce yet another word order, object-verb-subject (OVS). These properties of ASL allow it a variety of word orders, leading many to question which is the true, underlying, "basic" order. There are several other proposals that attempt to account for the flexibility of word order in ASL. One proposal is that languages like ASL are best described with a topic-comment structure, where words are ordered by their importance in the sentence rather than by their syntactic properties. Another hypothesis is that ASL exhibits free word order, in which syntax is not encoded in word order whatsoever, but can be encoded by other means (e.g. head nods, eyebrow movement, body position). A common misconception is that signs are iconically self-explanatory, that they are a transparent imitation of what they mean, or even that they are pantomime. In fact, many signs bear no resemblance to their referent, either because they were originally arbitrary symbols or because their iconicity has been obscured over time. Even so, in ASL iconicity plays a significant role; a high percentage of signs resemble their referents in some way. This may be due to the fact that the medium of sign--three-dimensional space--naturally allows more iconicity than oral language.